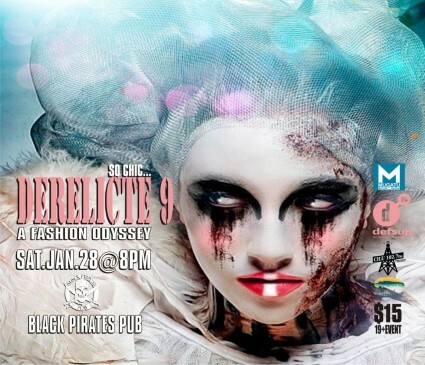 One fabulous night where Wearable Art, Fashion, Dance, Music and Performance co-mingle with runway models and contemporary design elements, unlike anything you may have seen before on the catwalk! •15 Wearable Art Pieces featured artists: Christian Chapman, Elizabeth Buset, Kasia Piech, Caitlyn Jean Mcmillan, Sam Shahsahabi, Lee Gastmier,Barbara Benwell, Katie Leena Beda / Dayna Slingerland, Leanna Marshall,Sarah Mason, Dee Marie, Nick Van Skahl, Elliott Doxtater-Wynn, boy Roland, Cree Stevens, Shayne Ehman, Hannah Doxtater-Wynn, Kathleen Baleja. • Spectacular Video Mapping Projections/Lighting by Illuminate and over one hundred Artists/Models! • Massive Raffle and Best D.I.Y Fashion/Costume Prizes…Dress Up and create your own fashion tribe! “Walk Off” Challenges, Paparazzi Moments! Premiere Performances: World Dance Centre w/ Dahab World Dancer(Flamenco ~totally acapella! ), Paloma Marquez (premiere drag performance! ), Veronika Swartz (burlesque/satire!-Toronto/MTV-Showtime /theme: dirty mermaid), Lisa Rose (tribal fusion bellydance! ), Miss Be.Muse (aka Beatrix Muse-burlesque! /theme: self control) and Derelicte Dancers! + DJ Dance Party @ night’s end. Your turn to dance on the catwalk!!! Featuring beats by Doran, and powered by… Electro Girls(glow whip spinning), Dee Marie & The Kidd (glow poi spinning), and spectacular lighting/projection mapping by Illuminate! This winter… be Haute! be Derelicte! PRIZE SPONSORS over $1000 in prizes to be won! Elfarrow Apparel, The Loop, mars. clothing, Perfect Fit Lingerie, Creation Body Piercing, Wojo’s Mojo, Hey Sailor, Silver Cedar Studio & Luc Despres Design, Jewels Of Crown – Vintage Boutique, Lisa’s Infinity (artisan jewellery), Painted Turtle Art Shop, Pneumaticity Hair Salon & Day Spa, Hill City Comics & Cards, Dining Room Studios, Uncle Mowglie’s Screen Printing, The Foundry, Rooster’s Bistro, The Sovereign Room, Gargoyles Grill And Ale + The Cheese Encounter, Red Lion Smokehouse, Lot 66 Tapas Bar & Restaurant, Underground Ink, The Growing Season Juice Collective, Tomlin Restaurant, New Day Records & Accessories, Boston Pizza Memorial Avenue, Magnus Theatre, Portside Restaurant & Bar, Maltese Grocery, Calico Coffeehouse, Both Hands Wood-Fired Pizzeria & Bakery, Marcia’s Merle Norman Cosmetics, The Bean Fiend Cafe and Sandwich Bar, International House of Tea, Sweet Escape Cake Cafe & Bakery, Fresh Air Thunder Bay: bikes by Cyclepath, lifestyle by Static, Espresso JOYA, Sweet Cherry Spa, St Paul Roastery, Port Arthur Legion Branch 5, Nook Thunder Bay (restaurant), Naxos Grille & Bar, Sushi Bowl, Prime Gelato, Lockstitch Fabrics, Resting Frog Yoga Studio, The Sweet North Bakery, Bight, Mystic Garden. • Official Paparazzi: Dan Ventrudo, Chad Charles Kirvan, Dave Janzen,Keegan Richard, Dan Varnus, Flashback Photo.